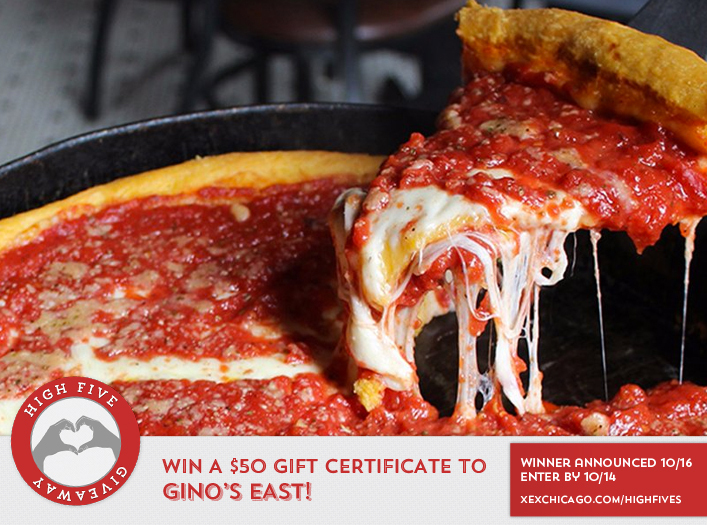 Win a $50 Gift Certificate to Gino’s East! Congratulations to Lisa Camboni on winning our 180th High Five Giveaway! Thanks to all who entered. Our next giveaway is for a $50 gift certificate to Gino’s East! Established in 1966, Gino’s began its deep dish adventure with customers so attached to its atmosphere they began scribbling their names on the wall to remember their visit. Gino’s is most famous for its patty style sausage and flaky buttery crust. Family friendly with a casual interior Gino’s can fill most appetites with it’s large array of menu items! Gino’s also has Delivery and carry-out. Gino’s has six locations in downtown Chicago. Learn more at ginoseast.com or call them at 312-266-3337. What organization do we feature an adoptable pet from every Wednesday on Facebook? Now, just add a comment to this post with the right answer to be eligible to win! The winner will be announced on Monday, October 16. Enter by midnight on Saturday, October 14! Anti-Cruelty Society, you guys rock! Anti cruelty society! Wonderful organization! The Anti-Cruelty Society. Kudos to you for doing this!